Annie’s audaciously astringent segmented narrative on existence. 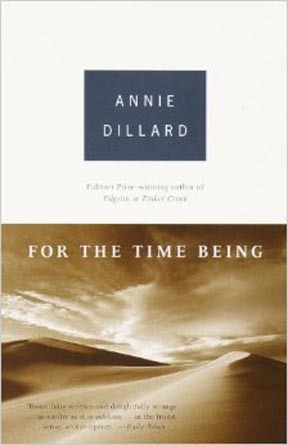 For the Time Being by Annie Dillard. Vintage Books. 204 pages. • Now (the humdrum hubris and passing pathology of our time). What’s impressive is to see these subjects come together. Sand, for instance: The earth’s rivers make it by breaking up rocks; the rivers spew it into the sea, which throws it back and makes beaches. The ocean creates no sand, just refines it. Neat—but? Well, who hasn’t wondered why ancient civilizations are so far down? Because of sand and loess: We are being patiently buried. The Earth steadily takes us back. The finest grit and carbon swirl everywhere and come to rest. Sand is further broken by windblast and water; it moves, and then settles. Every thirty years there’s a new inch of topsoil. 3,000 years is nothing. “Why is there sand in deserts? Because windblown sand collects in every low place, and deserts are low, like beaches,” Dillard writes. She wants us to ponder such accretion. We are as ephemeral as clouds, individually, of course, but so are our generations in the reach of time and so too our civilizations pass away. How old is America, again? Apparently we can know some things intellectually but not emotionally. Dillard finds herself reading the news more faithfully as she ages, getting her daily fix of the delusion that we and our time are unique in human history. No, we are not and it is not. These times of ours are ordinary times, a slice of life like any other. Who can bear to hear this, or will consider it? Though perhaps we are the last generation—now there’s a comfort. Take the bomb threat away and what are we? Ordinary beads on a never-ending string. Our time is a routine twist of an improbable yarn. We the living, meanwhile, continue to encounter each other: “Possibly when our brains fire their dying charges we will remember and see, to our dismay, not any best-loved face but instead some solitary figure, a stranger, whose image the mind retains.” Maybe, in her case, the punch-drunk ex-boxer who, working as a skycap, impersonated Elvis for her at an American airport’s curb. Or one of her other smoking buddies she shows huddled around the world’s museums, shops, and cultural hubs. Many times in Christian churches I have heard the pastor say to God, “All your actions show your wisdom and love.” Each time, I reach in vain for the courage to rise and shout, “That’s a lie!”—just to put things on a solid footing. In fact, the absolute is available to everyone in every age. There never was a more holy age than ours, and never a less. But who is wise? Dillard: “Confucius wept. Confucius, when he understood that he would soon die, wept.” Maybe he just loved the world and hated to leave it. But her sentence implies something less. Common surprise, perhaps. We’re just here, for the time being. We’ve forgotten, Dillard notes, our ancient ancestors’ stone knives that can skin a bear or open an abdomen with more ease than any of today’s shiny instruments. But we’re playing with new gizmos. Our thin lightweight laptop computers are only getting better. And we don’t mourn people we can’t imagine, whether they died yesterday in India or 10,000 years ago beneath our feet. Ha! Me too. You know, I read this book at a perfect time, and it cemented my fandom. I can see bouncing off it—it is astringent—but am thankful I didn’t. Truly a masterpiece.